The one to the right of the Buick is a Chrysler, perhaps? Probably a Chrysler product. I would guess a Desoto. The next car is a short-lived variation of Buick for 1929. The bulge at the belt-line did not go well with the buying public in early '29 so they reigned it in sometime mid-year if I recall correctly what I read about it 45 years ago. The sedan on the other side of the Packard may be a Stutz. I know they were one of the few with horizontal louvers in the hood. But I just don't know for sure, even though I know two people that have one each. Marmon, and their companion car Roosevelt also had horizontal louvers that early. Horizontal louvers became common with some major styling changes about 1933. I am sure there must be a few cars in that lot that I would really like to have! Especially that Packard in the front row. Thank you John Saylor for sharing this photo. 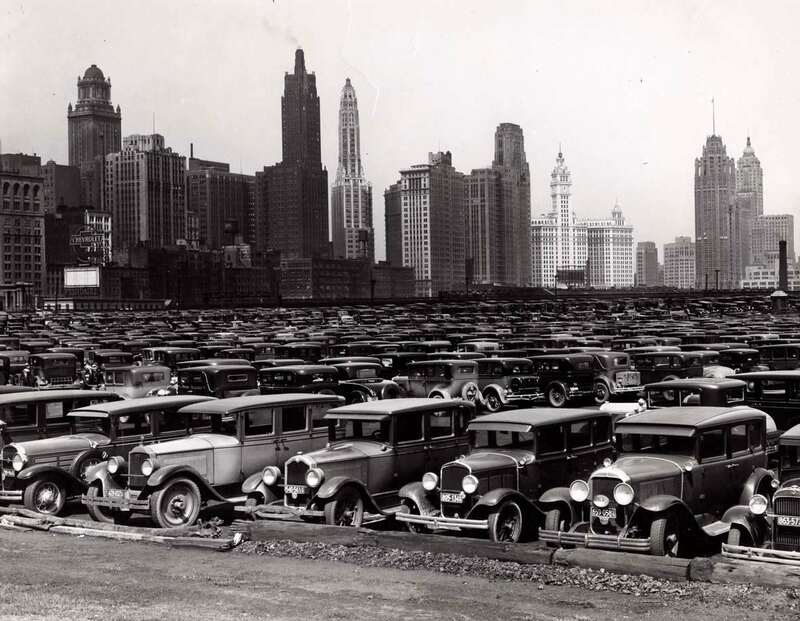 Imagine for a moment how much money would be sitting in that parking lot if it was today. I think some of those cars could bring six figures. That must be where the rich people parked! L to R: ? - Packard - Buick - ? - 1929 Buick - Hudson? I will run the photo on T.O.M. and I am sure the viewers will ID all of them in time. Walter P. Chrysler called the 1929 Buick,the pregnant Buick in early 1929.The name stuck,& sales dropped.The design was changed part way thru 1929 & sales improved. I own a 1929 McLaughlin Buick,model 29-20,its just a great car for touring. They must all be in the Chebby dealership in the left background looking at new cars!